So many iTunes questions, so little time. But that won't stop Kirk McElhearn from trying to help. So many iTunes problems, so little time. It’s frustrating to have to worry about all these glitches and quirks when you just want to listen to your music. This week I explain how to fix a common problem where iTunes splits albums among multiple Artist entries. I then discuss how to move your iTunes content to a new Mac when doing a clean install. And I give some tips for working with a Mac mini server without a display. Sometimes iTunes lists an artist many times, even once per song on an album. Q: If I look at my iTunes library in Artists view, I generally see one entry for each artist. But for some of them, there are multiple entries, sometimes one per song on an album. Is there any way to fix this? This happens often, and I get this question a lot. I see this regularly on my iTunes library, as you can see in the screenshot on the right. To fix this, find the album in Albums view. Click it, then press Command-I; this opens the Info window for all the tracks on the album. Change the name of the album; you can change it to anything you want. I generally just add an “x” after the name. 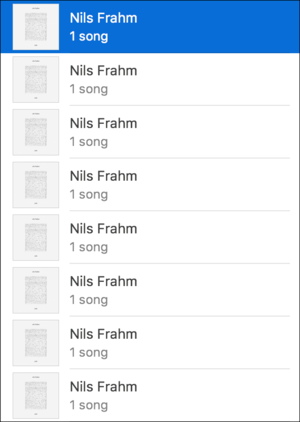 So, for the above example, I change Nils Frahm to Nils Frahmx. Click OK. You’ll find that the tracks are now grouped correctly under a single artist entry. Press Command-I to open the Info window for the album’s tracks again and change the name back to the correct name. Click OK, and the tracks will now be listed with the correct artist, and may be merged with any existing tracks by that artist in Artists view. Q: I just bought a new Mac. Since my current Mac is so old, I don’t want to use the Migration Assistant to set it up, but would rather do a clean install. How do I copy all my iTunes media and playlists to the new Mac? It’s a good idea to do a clean install when you get a new computer. This way, you avoid copying over apps you no longer use, and the many support files that have built up over the years. You also start afresh with your apps, and apply any settings you want to use. It can take a lot of time, but it makes you rethink how you work, which is a good thing. If you haven’t changed anything in iTunes’ settings, all the content you need to move is in your user folder, in /Music/iTunes. Here’s the contents of my /Music/iTunes folder. You’ll note that my iTunes Media folder is only 17kb; that’s because there’s nothing in it. I store my media on an external disk. You can tell iTunes to store your media in a different location in the Advanced preferences. So, to transfer all your iTunes content to the new Mac, you need to copy the /Music/iTunes folder, and, if you store your media on an external drive, you need to also copy the contents of that drive, or the folder on it that contains your media. Remember to go to iTunes’ Advanced preferences when you first launch the app to point it to that folder so it finds all your files. Q: I have a Mac mini media server in the basement playing iTunes through the headphone jack connected to my stereo receiver in the living room. Occasionally I would like to delete a song that is playing. I’d like to be able to grab my iPhone or iPad and either delete the song while it plays, or at least tag it for future deletion. Is there any way I can do this? If you connect to the Mac mini via Screen Sharing, you can manage iTunes from any Mac. You’d see the Mac mini’s display as though you were in front of it. You can then manipulate your iTunes library any way you want. Barring that, you could use a VNC (virtual network computing) app on an iOS device. I use the free VNC Viewer. It’s not the best way to work with an app like iTunes, though. What I would do is rate the song with one star with the iOS Remote app, then later delete the one-star files using screen sharing on a Mac. You can create a smart playlist that finds all the one-star songs, and delete them easily.